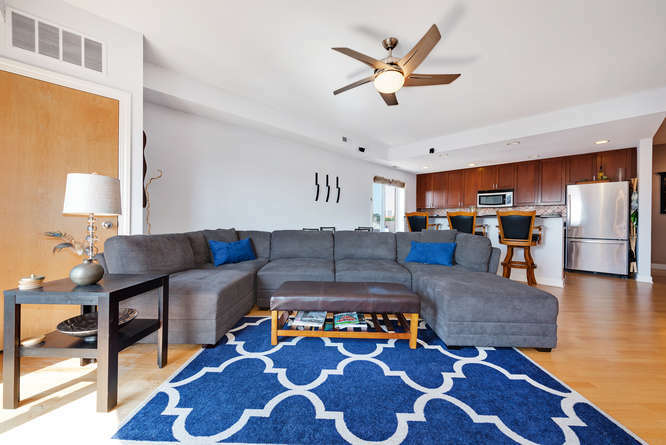 Rarely available split 2 bedroom, 2 bathroom condo in sought after building. Currently rented at $1700 per month. Lease expires March 31, 2018. Spectacular building in a great location. Enter into the unit and you’ll appreciate the foyer’s granite tiled floors. 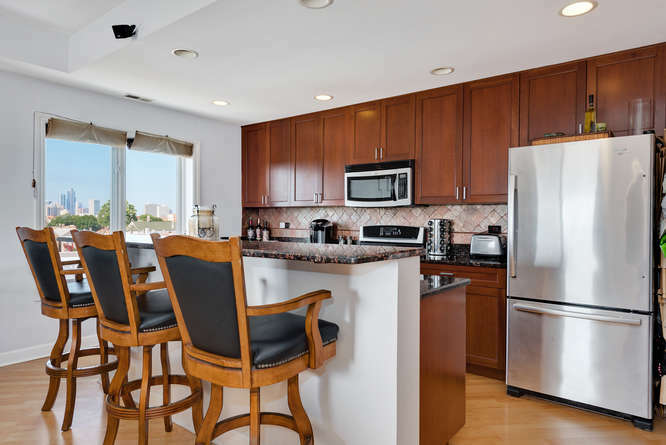 The kitchen features 42” cherry cabinetry, with a custom backsplash, granite counters, hardwood floors and a large breakfast bar. Magnificent view of the downtown area from the kitchen. 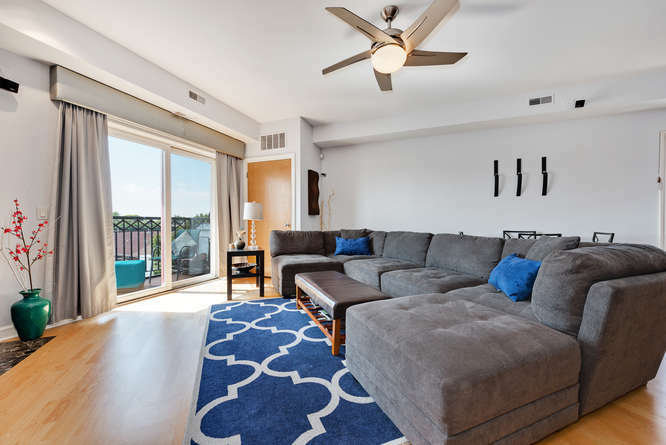 Spacious living area that features diagonal hardwood floors and west facing glass sliding doors that lead to your outdoor balcony. The sliders allow tons of sunlight to stream throughout the bright unit. Fireplace has a granite surround and is TV ready. 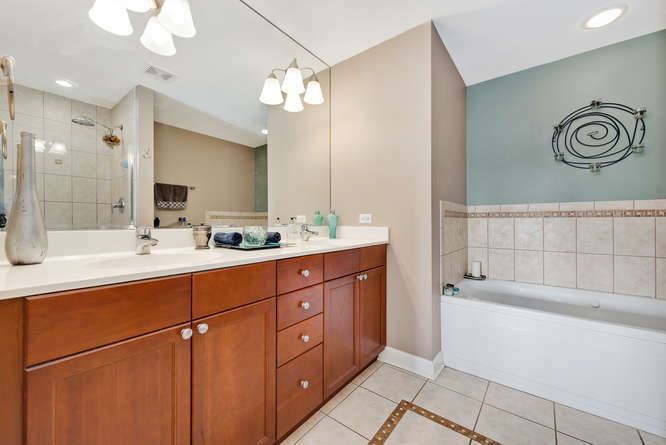 Master suite features a jetted tub, double sinks and a separate walk in shower. In unit washer/dryer. Heated indoor parking space is included in the price. The location is unbeatable. 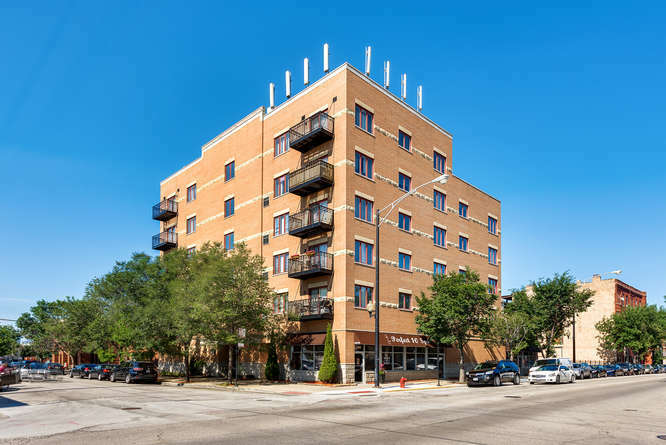 Walk to IIT, White Sox Park, CTA transportation nearby and easy on/off I-90/94. Rapidly appreciating area. 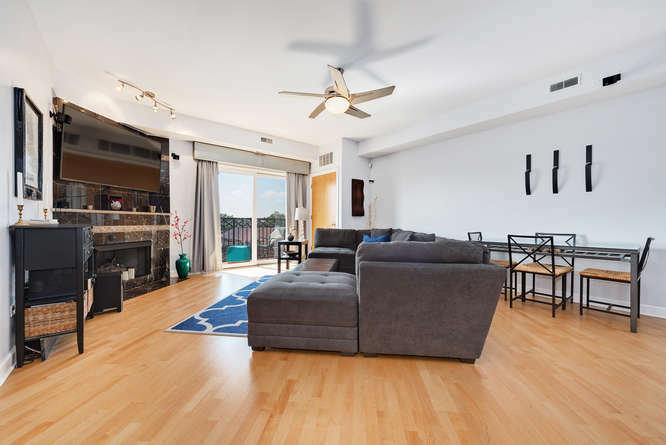 Hardwood floors set on the diagonal, and large windows to allow sunlight to stream through this magnificent unit. You’ll enjoy the view from almost any room. Great room for entertaining or relaxing. Large enough for a small dining table and a large sofa. You’ll appreciate the fireplace with granite surround, on a cold winter’s night. Glass sliding doors are featured that lead to your balcony. The large sliders allow tons of sunlight to stream in year round. 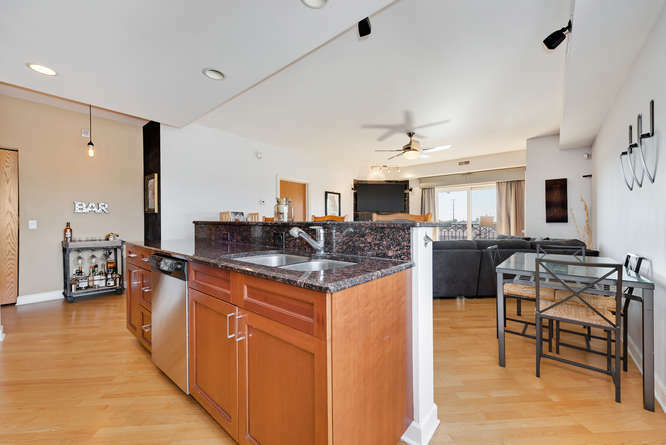 This unit is great for entertaining with the wide open floor plan, open kitchen and breakfast bar. 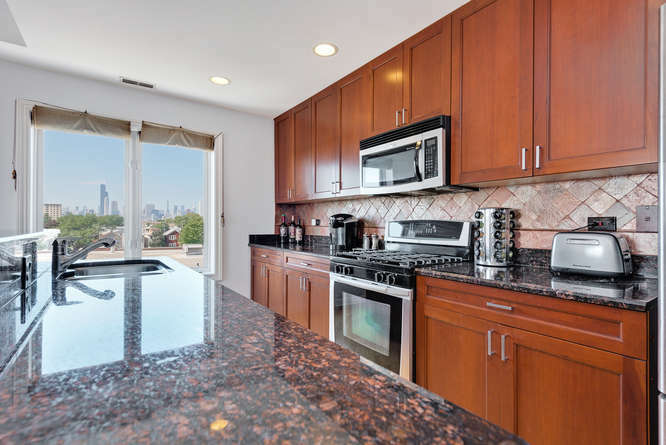 Cherry cabinetry, granite counters, custom backsplash and stainless appliances. Prepare your meals and enjoy the view out of the window. 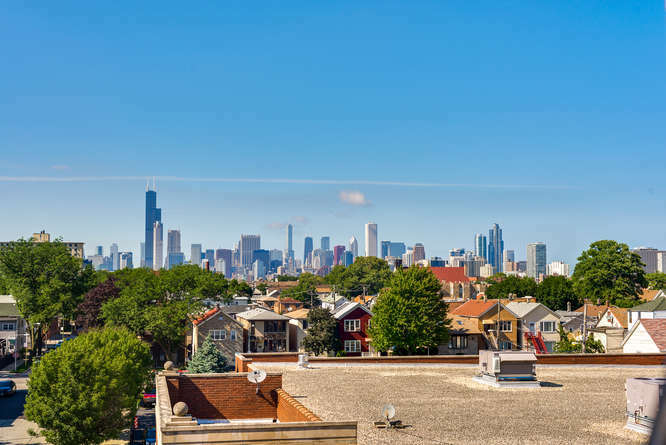 You’ll see a clear view of the Chicago Skyline featuring Willis Tower. While not a formal dining room the space does allow for informal dining with a small dining table or simply sit at the breakfast bar for a casual meal. The hardwood floors continue into the master bedroom. Look at the large window that gives you a great view of the city and tons of sunlight. You’ll also appreciate the two closets in this room. 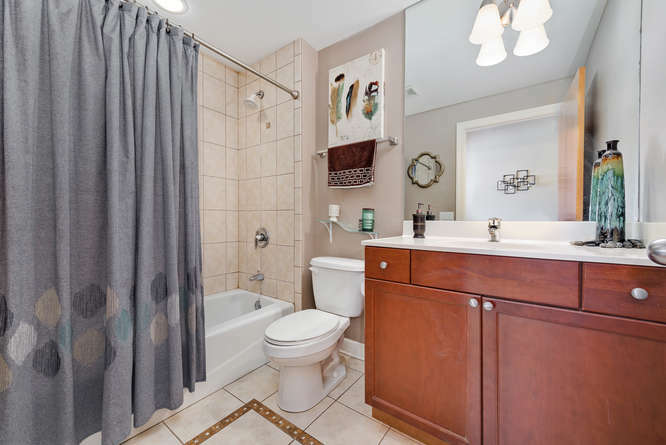 Double sinks, a jetted tub and separate walk-in shower along with neutral tiles make this a perfect retreat for you after a long day. Adorable 2nd bedroom. Hardwood floors continue into this room as well. 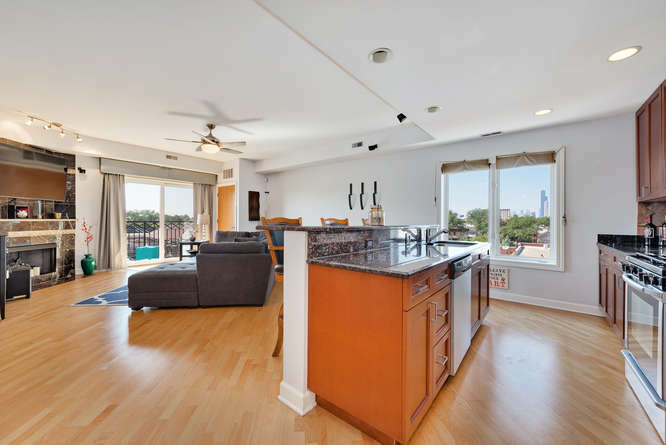 You’ll really appreciate the large window that faces the Chicago Skyline. Full size 2nd bath. Neutral tiles make it easy for you to decorate with your own style. 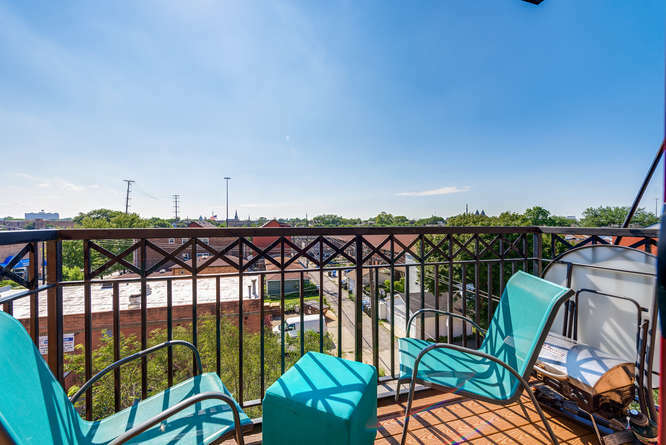 Enjoy the view from your balcony. You can grill out or simply enjoy a glass of wine on a warm summer’s night. Wow look at the view that you’ll see from almost any room in the unit. You can sit at the breakfast bar and enjoy this view while having your morning coffee.